I had made brownies using the Duncan Hines or Betty Crocker boxes before. They tasted pretty good but nothing like this batch of brownies made from scratch! Oh my oh my… soft just sweet enough and the pecans send you over the top. This was freshly stolen from Patti Jinich. Preheat the oven to 375°F. Butter a 9×13-inch baking dish, dust with flour and shake excess flour off. Slowly pour the chocolate mix into egg mixture, mixing with a spatula as you do, until completely combined. Pour that mixture into the dry ingredients and mix until thoroughly combined. Finally, toss in the caramelized pecans and gently fold. Pour into the prepared baking dish and place in the oven. 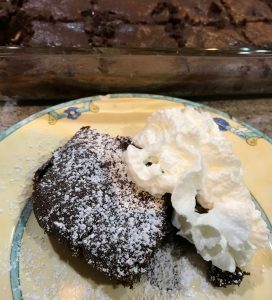 Bake for 20 minutes or until the top has lightly crisped, and the brownies are still moist but not wet (test with a toothpick).